Warm milk, cream and garlic clove together and then set aside to steep for 20 minutes. Beat eggs together then add the milk mixture, a flavoring of choice and accompanying herbs. If the vegetables are not roasted, choose one or two vegetables and sauté in a bit of olive oil until softened. Then, in a separate bowl, mix together the choice of vegetables and/or protein, choice of cheese and bread pieces. Transfer to a buttered medium-sized gratin dish or 8 small individual buttered gratin dishes. Pour the prepared milk mixture over the flavoured bread combination. Preheat oven to 180C and bake for 30-45 minutes. If using the small ramekins the cooking time will be reduced to 20-25 minutes. Sprinkle the pudding with grated Parmesan cheese before putting into oven. The puddings are ready when browned and lightly puffed and a knife inserted into the center comes out clean. Dijon or grainy mustard, sweet chili sauce, tapenade. Chop and freeze fresh herbs before they go off in the fridge. Save eggs before they go off by removing them from their shells, beating them and placing them in well marked containers in the freezer. 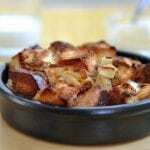 Use up bread by making bread puddings, croutons or bread crumbs.